Royal Green Saw Palmetto Complex is a unique herbal support, unique because it isn`t just our Saw Palmetto which is 100% certified organic, it also applies to the Turmeric, green tea, Ashwagandha, stinging nettle, maitake, ginger, selenium and black pepper we have used. The result is a pure, highly concentrated and full spectrum product with an optimal effect. Experience the difference now. Saw palmetto (serenoa repens), capsule: HPMC, turmeric (Curcuma longa) green tea (Camellia sinensis), ashwagandha (Withania somnifera), stinging nettle (Urtica dioica), maitake (Grifola frondosa), anti-caking agents: talc and silicon dioxide, ginger (Zingiber officinale), black mustard extract (Brassica nigra), black pepper (Piper nigrum). store in a cool dry place and keep out of reach of any young children. Consult and expert before use in case of pregnancy, lactation, illness or medicine usage. Below are reviews of Royal Green Saw Palmetto - 60 Vegicaps by bodykind customers. If you have tried this product we'd love to hear what you think so please leave a review. 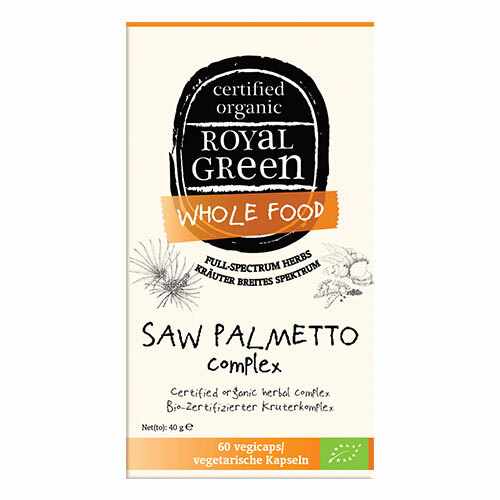 Royal Green Saw Palmetto Complex is a unique herbal support, unique because it isn`t just our Saw Palmetto which is 100% certified organic.